One amazing thing about quilting is that we can really preserve things in our work. Whether it be clothes from a lost loved one or even the work of others. 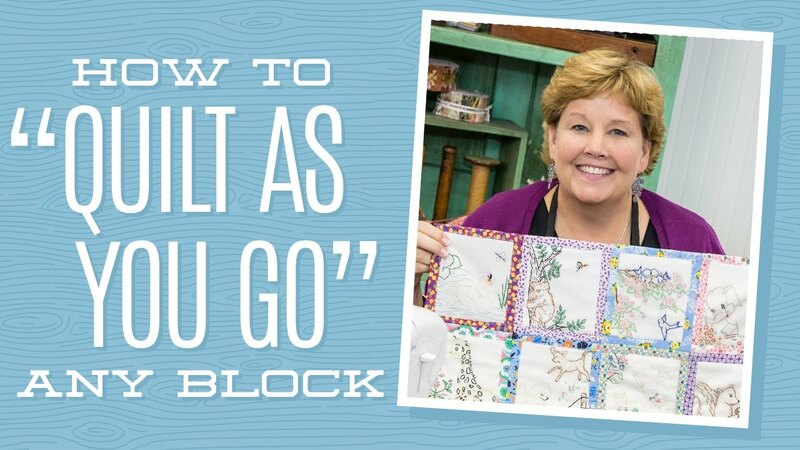 Below is a quilt tutorial by Jenny at The Missouri Star Quilt Company about quilting as we go and thats a great way to include special items into our quilts! In this tutorial she uses blocks that she bought from yard sales or antique shops. These are old blocks made from or kept by someone else and they are adorable to use! The quilt she displays on her idea board has a nstalgic and vintage look about it. In the quilt as we go tutorial she teaches us how to take these small, delicate pieces and put them into something colorful and unifying! Before we really dive into the project she is showing us we will need our embroidered blocks, a little bit of batting, and some ten inch squares. Jenny pairs the older embroidered blocks with the fun colorful fabric wonderfully. It ends up looking so nice and she shows us the quilt as your go technique in the process. Make sure you pick out a good fabric to go with the embroidered blocks. Jenny does an amazing job going over everything as well and the quilt turns out so pretty. It’s a beautiful combination with a vintage twist!